The chief executive of the world's second largest investment bank has warned that London "will stall" because of the risks from the Brexit process. Lloyd Blankfein said that his firm, Goldman Sachs, which employs 6,500 people in the UK, had "contingency plans" to move people depending on the outcome of the negotiations. Mr Blankfein said he hoped the bank would not have to trigger the plans. He wants to keep as much of its activities in the UK as possible. 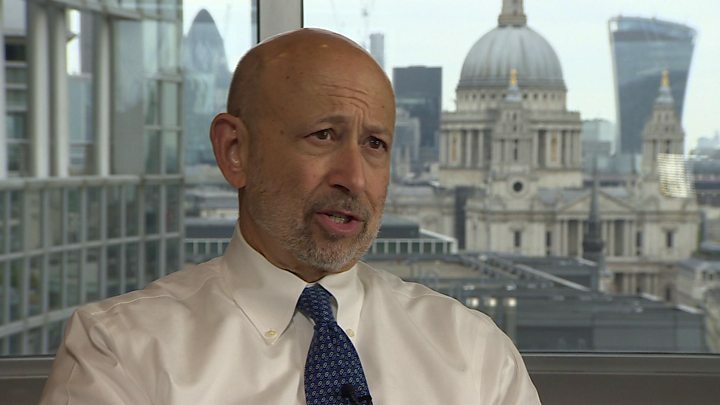 In an interview with the BBC, Mr Blankfein revealed the firm had held discussions with different cities across Europe and had looked at increasing office space in a number of locations, thought to include Frankfurt, the financial capital of Germany, and Dublin. Mr Blankfein said both sides in the Brexit negotiations were playing for very high economic stakes and that there would need to be an implementation period of at least "a couple of years" once the exit deal had been agreed by the spring of 2019. If there was not, banks like Goldman would have to act "prematurely" and possibly move jobs and activities. "We are talking about the long-term stability of huge economies with hundreds of millions of people and livelihoods at stake and huge gross domestic product," he told me. "So, if it takes a little while - I'd rather get it right than do things quickly." I asked him if the expansion of London as a financial capital over the last three decades would go into reverse because of the Brexit process. "I don't think it will totally reverse," he told me. "It will stall, it might backtrack a bit, it just depends on a lot of things about which we are uncertain and I know there isn't certainty at the moment." More than one million people work in the financial services sector in the UK and it pays over £70bn a year in taxes to the government, 11.5% of all receipts. The fear from many in the City is that if there is a poor deal with the EU, many of those jobs will move on to the continent. The head of Goldman Sachs Europe, Richard Gnodde, has already suggested that Goldman is looking to increase its presence on the European continent by "hundreds" of people, although the bank has not said yet whether jobs will be lost in the UK. I asked Mr Blankfein directly if jobs would move out of the capital. "We don't have big plans now, we are looking - we are trying to avoid," he answered. Mr Blankfein said there was a risk of banks having a "smaller footprint" in Britain. "Obviously, a lot of people elect to have their European business concentrated in a single place, and the easiest place, certainly, for the biggest economy in the world [America] to concentrate would be the UK - the culture, the language, the special relationship, and we are an example of that," he said. "The UK has a big history - certainly in financial services - of managing markets and having a fair system that makes it very attractive, but it extends to other industries as well. "And if you cannot benefit from access to the EU from the UK - and nobody knows what those rules and determinations will be - then the risk is there will be some adjustment that will cause some people to have a smaller footprint in the UK." Mr Blankfein said he wanted to see as few barriers as possible to financial services being traded between Britain and the rest of the EU. The prime minister has said that the UK will leave the single market but has argued she wants a comprehensive trade deal to replace the present access arrangements. Labour has said it would scrap Mrs May's Brexit plan, outlined in a White Paper in February, and keep access to the single market "on the table". But with incendiary language from both sides in the negotiations - the UK government and the rest of the EU - many fear that a new free trade deal will be very difficult to negotiate. The EU has also made it clear that any deal will not be as economically advantageous to Britain as being a full member of the bloc. The European Commission announced on Thursday that it is looking at EU-specific "location requirements" for large parts of financial services at present centred in London including lucrative euro trading. Mr Blankfein - who said he understood the negotiations weren't "being done for our comfort or convenience" - warned that the safety and security of the financial system was also important and that any rapid changes and fragmentation would put that at risk. He said that basing most of a bank's activities in one place was "sounder" and more efficient and that in 10 years' time it was still very likely that London would be its largest EU office by a substantial margin. "I would say that it is our hope that we will be able to conduct our business as close as we can to the way we conduct it today," Mr Blankfein said. "That is, we could have German nationals marketing German securities to German investors from the UK. "And be resident in the UK and accomplish that. "I would like and it is my hope that we can do as much of that as possible. "I think it is in the best interests of the UK, the best interests of Germany, to have London - which has a lot of experience about regulating these markets - continue close to that model." Goldman, which has faced billions of dollars-worth of fines over its behaviour in the run up to the financial crisis, is one of the world's most successful international banks. It is second only to JP Morgan, also American, in the league table of investment banks. If it were to decide to relocate significant parts of its business to the continent, it would be taken as a signal about the attractiveness of London as a place to do business. "Without knowing how things will turn out we have to plan for a number of contingencies," Mr Blankfein said about possible job losses. "And our hope is we don't have to implement anything until we know what we have to implement. "But if there is no period of time to implement whatever changes are brought about in a negotiation, we may have to do things prematurely and we may have to do a range of things as a precaution and take steps." Mr Blankfein added: "But right now we are trying to avoid that and so our advice and our interests would be benefitted not by one outcome versus another - although clearly we would like to stay close to where we are today - but what we are really looking for at this moment, the finest point we can make, is a long enough implementation period so we can begin the process of adjustment after we know what we are adjusting to." Referring to the language used by both sides this week - Theresa May said some in the EU were trying to interfere in the general election by attacking Britain's position - Mr Blankfein said: "A couple of years is a long time for people to calm down and really take stock of what their long term economic interests are. "And in the UK it is to try and have a very good relationship with a very big trading bloc, and for the European market to recognise what a big economy the UK is."